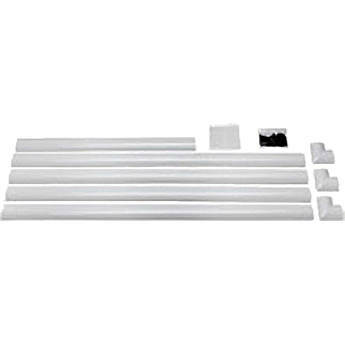 This ELPCK01 On Wall Cable Management Kit from Epson is compatible with the BrightLink 450Wi Interactive Projector, 450Wi Interactive Projector with RM Easiteach Software, PowerLite 450W Multimedia Projector, and the PowerLite 460 Multimedia Projector. The Kit allows seamless integration of ultra-short throw projectors in environments where it is not possible or convenient to pull wires inside the wall (cables not included). Simply cut the tracks to the lengths you want and attach directly to the wall surface. Each track is 2.5" (63.5mm) wide and stands 3/4" (19mm) from the wall surface when covered. Box Dimensions (LxWxH) 59.0 x 7.0 x 4.0"